"Ponoma" is a female Latin name meaning "Fruit Tree." This unique and distinguished apple recognition tree is like no other! 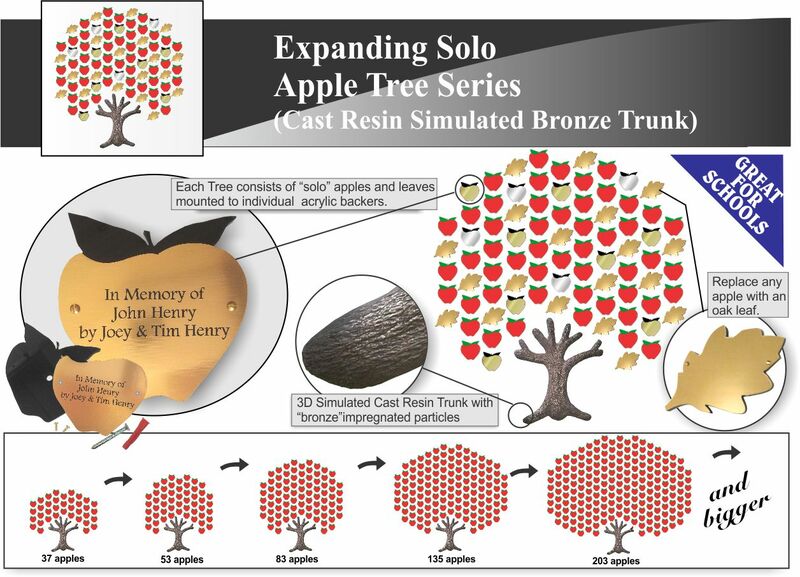 This Apple Tree is available in configurations from 37 apples to over 500! All "Ponoma" trees come with our cast resin simulated bronze trunk measuring 16-1/2" tall x 14" wide. Apples measure 3" x 3" and consist of a front plate available in red, gold, silver, copper and bronze and mount to individual black (or green) acrylic backers. Each apple can be replaced by an "oak" leaf measuring 3" x 3-7/8". Oak leaves come in gold, silver, copper or bronze and have an acrylic backer also. Leaves and apples are laser engraved with your custom text. All acrylic backers for apples and leaves mount permanently to the wall, and front plates mount to backers with 2 small screws for easy changeability. A full size paper template is included for mounting apples in correct positions. All hardware included...........a complete package for your fund raising campaign or donor recognition needs! Made in the USA! For indoor use only. * ASK US ABOUT OUR SPECIAL DISCOUNTS & PROMOTIONS!